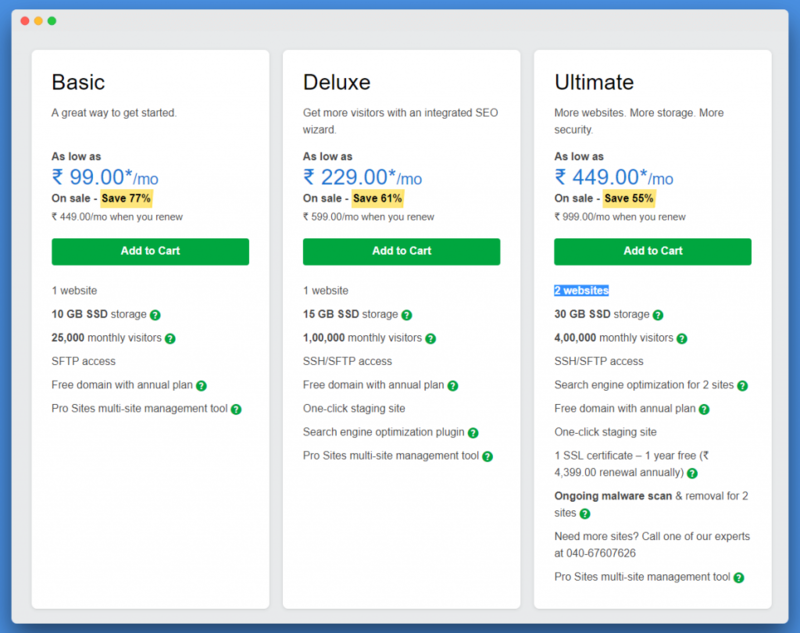 HostGator vs GoDaddy – Performance, Speed, Support & Pricing Compared. Speed Test & Response Time – HostGator vs GoDaddy. Features & Pricing – HostGator vs GoDaddy. Money Back Guarantee – HostGator vs GoDaddy. Control Panel & User Interface – HostGator vs GoDaddy. GoDaddy Maximum Discount Promotion Codes. HostGator Maximum Discount Promotion Code. Hostgator vs GoDaddy: Both Hostgator and GoDaddy are two big web hosting giant in the market. While GoDaddy is leading registrar in the domain name business and Hostgator is leading giant in web hosting business. In this post, we are sharing a full comparison of Hostgator vs GoDaddy by Performance, Speed, Customer Support, Pricing, and many more. Picking the right best hosting is always a confusing thing especially for a newbies blogger and marketers because there are too many web hosting giants in the market and we’re still confused about choosing the best web hosting. Most of us are confused in selecting the best web hosting giant between Hostgator vs GoDaddy. What should we choose between Hostgator and GoDaddy? So keeping in mind all these questions, we had published this article on selecting the best web hosting giant between HostGator and GoDaddy. In this article, we’ll talk about all the essential features like Performance, Uptime, Speed, Pricing, Quality and many more between selecting the best web hosting. Also, you can also check our “Best WordPress Hosting Providers“, where we had listed top 7 big web hosting giants for WordPress hosting by their uptime, price, support, quality, etc. You can read those as well. Here is a quick introduction on both of the biggest web hosting giants. Here we’re sharing a glimpse of both hosting giants with their pros and cons and even with their hosting packages and plans. Go through to it to learn more about Hostgator and GoDaddy hosting giants. Hostgator is one of the biggest and most affordable web hosting company in the market. There are millions of website hosted on their affordable hosting plans since 2002. Hostgator belongs to Endurance International Group (EIG), the same company who even hold a ton of more biggest hosting giants under their company like iPage Hosting, BlueHost, BigRock and many more. As Hostgator is one of the biggest web hosting giant in the market, they provide every hosting plans like Shared Hosting, VPS Hosting, Dedicated Hosting, Cloud Hosting and WordPress Hosting to attract all kinds of customers worldwide. GoDaddy is another one of the biggest and most affordable web hosting company in the market. They are considered the leading domain name registrar worldwide. According to GoDaddy 2017 data, they are serving more than 17 Million customers with over 6,000 employees worldwide. They provide the most affordable hosting plans in the market today. Now, Anyone can afford web hosting for their blog or business with their $1/month hosting plan. Moreover, you even get a Free Domain name with their annual hosting purchase. According to Wikipedia, In 2013, GoDaddy was reported as the largest ICANN-accredited registrar in the world, at the size of four times their closest competitor. They also have a 270,000 square foot facility in Phoenix, Arizona. As GoDaddy is leading domain name registrar with their most affordable hosting plans, they offer every hosting for every business needs. You can choose from Shared Hosting Plans, WordPress Hosting Plans, VPS Hosting, Cloud Hosting Packages and from Dedicated Hosting for your business. HostGator and GoDaddy both promises 99.9% uptime and performance. Here we had shared a detailed comparison of both web hosting giants. Take a look at their performances & features below. HostGator invest more than a million dollar yearly for better and new technologies. GoDaddy also spends million dollars and can also provide Intel Core i7 Processor in their servers. Take a glimpse at these features below. Speed and uptime is an essential feature in any web hosting giant. Both Hostgator and GoDaddy promises 99.9% uptime and fast speed with their latest technologies. In this comparison, I had used two newly registered domain names on both GoDaddy economy hosting plan and Hostgator baby plan. Here is the result below of the two hosting giants. In this Speed testing comparison, I had used Pingdom, & BitCatcha with same WordPress Theme, Plugin and with the same customizations. Will share Pingdom result soon. Here we had tested both hosting giants metrics and both performed average on Bbitcatcha. The Bitcatcha has given the “C” grade for both hosting with following response time. According to traffic spike simulations done by Mark Berka on his web hosting rankings page, both HostGator’s and GoDaddy’s shared hosting plans face some difficulties when handling sudden traffic spikes. For example, when faced with 50 concurrent visitors, around 33% of requests handled by the HostGator server returned an error, while this figure was 55% for GoDaddy. At five concurrent website visitors, HostGator’s server handled the visitors very well, but GoDaddy was still having some problems, with around 4% of server requests timing out. Overall, if you expect your website to serve a large number of visitors, Hostgator is a better choice. Let’s compare the features of the most basic shared hosting packages on both GoDaddy and HostGator. To start with, Godaddy throws in a free domain when you sign up for the annual plans. You’ll also get a free business email service for the first year. HostGator do not offer the domain for free. HostGator provides free SSL. SSLs required for any tool which ensures the visitors that they are on the secured site. Both Godaddy and HostGator provide excellent WordPress integration. The best thing about WordPress is you need not to interact with your web hosting once you’ve completed installing it on your domain. On both GoDaddy and HostGator, you can set up a WordPress website in minutes. Though both web hosting services provide everything to run the WordPress blogs, HostGator has a slight edge over GoDaddy because of it’s fast installation and easy to use control panel. We need to have a backup of databases, files, and emails in the case of website getting hacked or server crash. Both GoDaddy and HostGator offers self-managed backups for free. Hostgator charges $15-$20 to restore the backup, whereas GoDaddy charges a whopping $180 – unless you are using their WordPress Hosting service, in which case restorations are free. However, remember that if you are using WordPress, you can install your own backup plugin and manage backups yourself. This way you do not have to rely on your hosting provider’s backup service. Apart from these, there are no significant differences in what they offer. Newbies may tend towards GoDaddy as they’ll have a domain and web hosting at one place. However, HostGator is not far behind as they are the best when it comes to usability. Their user-interface is super simple, and it is easy for beginners to control all the aspects of their websites. 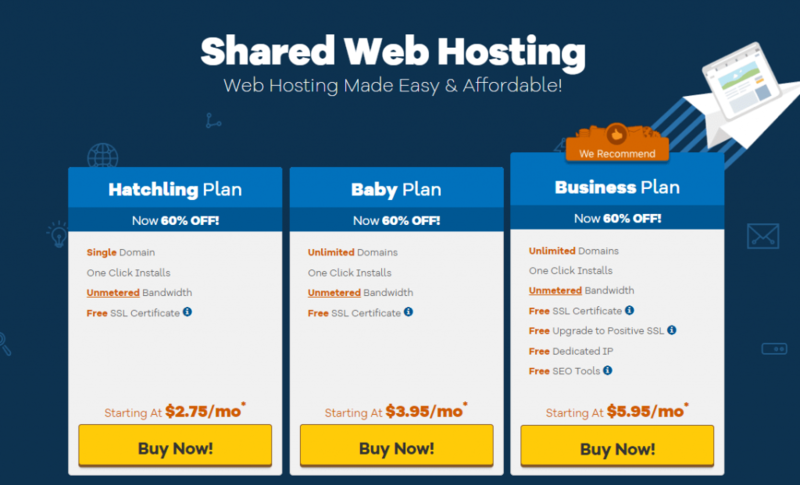 HostGator shared web hosting has got three plans: Hatchling, Baby and Business. The Hatchling plan is their bread-and-butter. You can host just a single domain on the hatchling plan. Baby and Business plans can host unlimited domains. The best part is the bandwidth, and disk space are unmetered in all the plans. It costs around $3 per month for the Hatchling, $4 per month for Baby and $6 per month for the Business (Get 60% OFF on All Hosting, Check Below Promo Code) plans if you choose to sign up for the annual cycle. 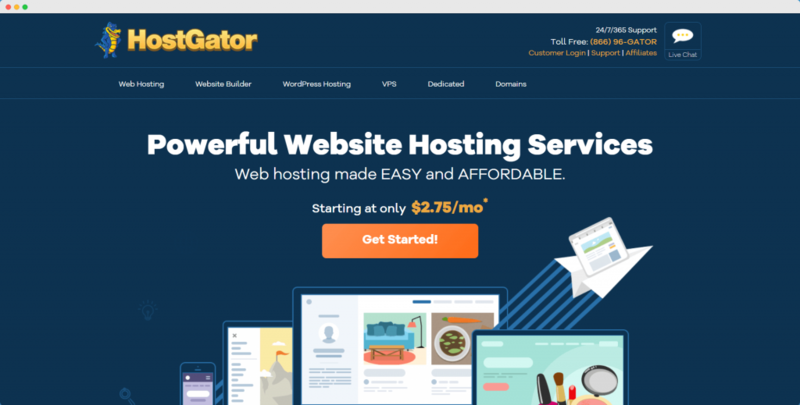 You can get the hatching plan from Hostgator at just USD 2 Per Month, Use the below promo code to get flat 60% OFF on all hosting purchases. Coming to GoDaddy, they offer four plans. Economy, Deluxe, Ultimate, and Maximum. All these plans provide unlimited bandwidth. Godaddy also provides tons of GoDaddy promo codes through which you can get up to 88% OFF on their domain name. Money back guarantees policy is adopted by all the web hosting companies. It helps to inspire confidence in new customers and gives them a chance to evaluate the quality of web hosting services without any risk. HostGator offer 45 days, and GoDaddy provides a 30-day money back guarantee on all the web hosting plans. Note that while GoDaddy will issue you a refund automatically after you cancel your plan within the money-back period, HostGator will not – you’ll need to contact them manually within 48 hours of requesting a cancellation to receive your refund. Refund not valid for dedicated servers, administrative fees, install fees for custom software, or domain name purchases. Offer valid only for the first package purchased for billing accounts less than 45 days old. Refunds for orders of only $0.01 are not eligible. Packages paid for with check, money order, or bank wire transfers are not eligible for the refund. HostGator’s money back policy is liberal compared to GoDaddy. HostGator is the clear winner here. HostGator’s cPanel may not look fancy, but it is the most used control panel. It is super simple, and even the newbies can get a grasp on it within a few minutes. Their one-click script installers work like a charm, especially for the newbies. On the other hand, GoDaddy has got its style of the control panel. Of course, it provides the one-click script installers but it seems to be little cluttered, and it is not as simple as the popular cPanel. However, it is not very difficult to get used to it. Customer support is an important thing you need to check while choosing the web hosting service for your blog or website. You would not want to lose your visitors to some technical glitches. So, a reliable customer support team who can quickly fix the issue is the crucial thing for any blogger or webmaster. Both GoDaddy and HostGator provides 24/7/365 customer support. They offer customer support via live chat, e-mail, and ticketing systems. GoDaddy claims that it has an award-winning customer support team and indeed they offer excellent support. The support team is knowledgeable, prompt and friendly with quick responses. They’re geared up to provide solutions to fix any technical glitched day or night. HostGator has more than 1000 customer care executives who provide excellent support around the clock. Their ticketing system is top-notch. When compared to HostGator, it may take a little more time to get in touch with the GoDaddy’s customer support. We can say HostGator is a clear winner as the quick responses matter a lot especially in the times of emergency. GoDaddy’s support is only available on business days between 5 AM and 6 PM MST and the average queue time is extremely long – rarely shorter than 10 minutes, and frequently longer than 45 minutes. HostGator, on the other hand, offers a 24/7 live chat, with queue times that rarely exceed three minutes. Overall, if your preferred method of requesting support is Live Chat, HostGator is a better choice. HostGator and GoDaddy regularly announce unbelievable discounts to grab the attention of potential customers. It is wise to take advantage of these offers, instead of paying the total fees. The coupon code makes a huge difference. Most of the times, you have to search for the best coupons to strike a great deal. The below links will give you the best discounts on GoDaddy hosting and HostGator hosting which are available right now! GoDaddy is offering a flat $1/Month offer on its economy hosting plans. You can get GoDaddy hosting with a free domain name at just $1/Month. You can save a lot (More than 60% OFF) on other hosting packages. Visit the activated deal link below to activate the offer. 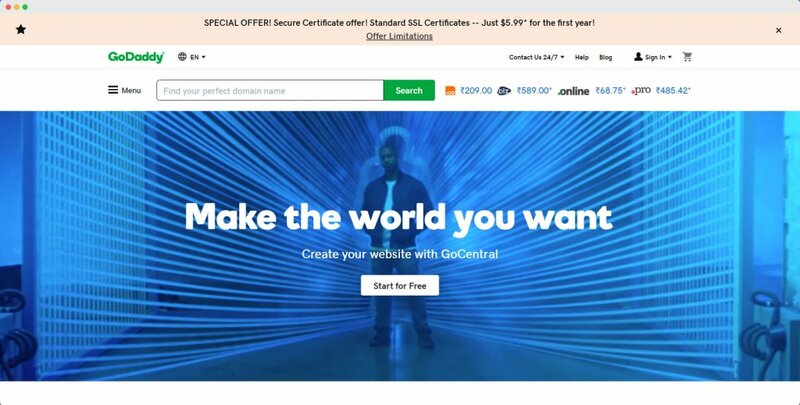 It is an exclusive GoDaddy promo code; you can get.COM domain name for just 0.99 cents for the 1st year using this coupon code. It is an exclusive GoDaddy coupon code for new users. Grab your first domain name from Godaddy by using the below coupon code. Using our exclusive Hostgator coupon, you can save flat 60% OFF on all web hosting plans. This coupon code is valid for hosting purchase. It may help you to save 60% OFF on all hosting plans. HostGator and GoDaddy have got more similarities than differences in what they offer. Well, it all depends on your requirements. If you are someone who wants to manage domain and web hosting from a single platform, then go for GoDaddy. and Hostgator, if you’re looking for a reliable web hosting with a powerful website builder. If you are on tight budget, you can go GoDaddy $1/month where you’ll get a free domain and hosting for just $12 per year. You can’t go wrong with either GoDaddy or HostGator. However, there has to be a clear winner. We would pick HostGator as the best host when compared to GoDaddy. It is a bit better in performance, user-interface and customer support when compared to GoDaddy. Hostgator vs GoDaddy: Both Hostgator and GoDaddy are two big web hosting giant in the market. While GoDaddy is leading registrar in the domain name business and Hostgator is leading giant in web hosting business. Here we had compared both hosting plans and here is the result. Hello, Nice article on hosting. But I prefer using Hostgator because it’s reliable and easy to setup. I am using Cloud hosting because it’s cheap and it can handle heavy traffic. But in Godaddy, u don’t get the option of cloud hosting. And another hosting service of GoDaddy is very high. Thanks for sharing this valuable insight on HostGator vs GoDaddy. Both are best web hosting.